As I have pointed out before in these pages, the security relationship between Indonesia, Southeast Asia’s largest state, and Singapore, the subregion’s smallest, has tended to be prickly historically speaking. It took nearly a year for Indonesia to even officially recognize Singapore’s independence from Malaysia following Jakarta’s violent opposition to the creation of Malaysia, known as Konfrontasi. Even over the past few years, disagreements have tended to simmer from time to time, whether around traditional issues such as air space or non-traditional security matters like the annual haze problem. Nonetheless, the two countries have still maintained a cordial defense relationship that includes the usual components, including visits, exchanges, and exercises. They have also made efforts to better manage lingering challenges, with one recent significant milestone being the conclusion of a landmark maritime boundary treaty that came into force in February as the two countries commemorate the 50th anniversary of their relationship this year (See: “Indonesia, Singapore Conclude Military Exercise Amid Anniversary”). From August 22 to August 26, the Republic of Singapore Navy (RSN) and the Indonesian Navy (TNI-AL) conducted another iteration of their bilateral mine-countermeasure (MCM) exercise. The Joint MINEX, now in its seventeenth iteration, has been hailed by both sides over the years as an important means to enhance professional knowledge and interoperability between the two navies. This year, the seventeenth iteration of Joint MINEX saw the participation of more than 300 personnel from the RSN and TNI-AL, according to a statement by Singapore’s defense ministry (MINDEF). MINDEF added that the exercise consisted of shore-based planning and simulation training, breakthrough operations where the two navies ensured that waters were cleared of mines for the safe transit of international merchant shipping, and live gunnery-firings and joint MCM operations against simulated mine threats off the eastern coast of Bintan, Indonesia. 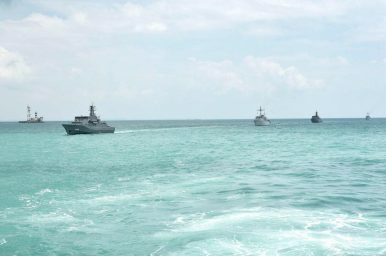 The RSN participated in the exercise with two Bedok-class Mine-Countermeasure Vessels (MCMVs), the RSS Bedok and RSS Punggol, while the TNI-AL sent two Pulau Rengat-class MCMVs, the KRI Pulau Rengat and KRI Pulau Rupat, and a Kondor-class Minesweeper, KRI Pulau Rangsang.